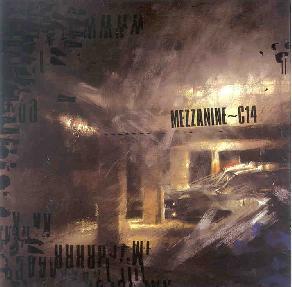 Mezzanine~C14 - "He Keeps Silent And Sacrifices Himself"
He Keeps Silent and Sacrifices Himself is Mezzanine ~ C14’s third release, and its quite a searing collection of post-rock thrash. Aggressive and relentless, He Keeps Silent features ten relatively brief anthems (“Devious” is the longest track at 3:48) of inner city rebellion and post-apocalyptic desperation. Will Walker’s chainsaw guitar and angry distortion-laden vocals are clearly the center of attention in songs like “Start Fires,” “Night Crawler” and “Knife Wielder.” But the bass drive of Mark Cyst and the crash and burn drumming of Nick Mitchell are the fuel that drives this rocket from its metro mayhem to the borders of underground noise rock. The pace never slackens or lightens up as Mezzanine ~ C14 seems intent on crushing all opposition with its blitzkrieg wall of sound. Naturally, this is the band’s greatest virtue, yet at the same time its most pernicious vice. You can’t live in terminal overdrive forever, at least not without eventually going down in flames. There is, however, a subtle “artiness” to some of the pieces on He Keeps Silent, particularly the angular and jagged rhythms of “You Have the Freedom to Do as I Say,” an excellent pastiche of frenzied frustration and pure rock-n-roll anarchy worthy of Iggy and the Stooges at their most incendiary. The uncredited track that closes the album is pure guitar experimentalism, similar in texture and execution to Sonic Youth; its quiet barrage of amplified chiming dissonance could almost serve as a brief soundtrack for a snuff film. Disturbing stuff but worthwhile for those looking for a little angst and attitude with their rock-a-rolla. For more information you can visit the Mezzanine~C14 web site at: http://www.breakeven.org/mezzanine~C14. Visit the Break Even Records web site at: http://www.breakeven.org. Contact via snail mail c/o Break Even Records; PO Box 42469. Philadelphia, PA 19101.